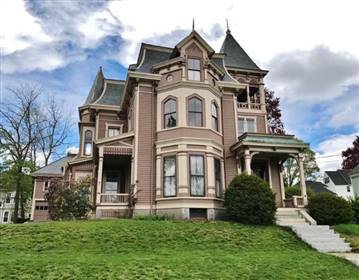 1879 Second Empire Victorian Mansion in Historic District in small Massachusetts City. House contains most of original features including, natural ash, mahogany, and oak moldings, fireplaces, windows, slate roof, claw foot tubs, and many more period finishes. First floor features large rooms with over 10ft ceilings and reproduction period wall paper and lighting. Finished area is 4600 square feet with an additional 1200 + sqft unfinished attached with furniture/artifacts from all previous owners dating back to the late 1800's. Large 144sqft. open observation tower lover off attic looks sunken English garden below and provides a dramatic and amazing views of the surrounding cities. Additional 2000 + two story carriage house attached chock full of more furniture many other items. Unfinished Basement is an additional 1700+ sqft. Main house has 3 zone central AC. Kitchen contains furniture grad wood cabinets that match period wood moldings and 1920's working Glenwood stove. Original soapstone sink located in breakfast room off kitchen. Two original bathrooms (plumbing disconnected) equipped with pull chain toilets and original sinks.